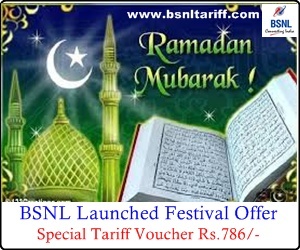 Public Sector Unit Bharat Sanchar Nigam Limited (BSNL) has introduced Festival Special Tariff Voucher (STV) on Occasion of Ramzan Festival across India with Full Talk Value in Minutes under Prepaid Mobile Services for limited period on promotional basis. This promotional Festival Special Tariff Voucher will be implemented and with effect from 11-07-2013 to 09-08-2013. Note: The implementation of the above Ramzan STV in each Telecom Circle may varies according their technical feasibility and availability.